“All the parts are just pushed together and not glued. That way I can break it down and carry it all in a bag. Also, if a buddy (not me!) happens to shoot the stand, I can easily replace just the damaged piece. The last 6 inches of the furring strips are wittled-down a bit so they can be pushed into the upright pipes with a little friction. The cardboard is 2 x 3 feet, and I use a staple gun to attach it to the furring strips. Then I just staple the target onto the cardboard and go at it. 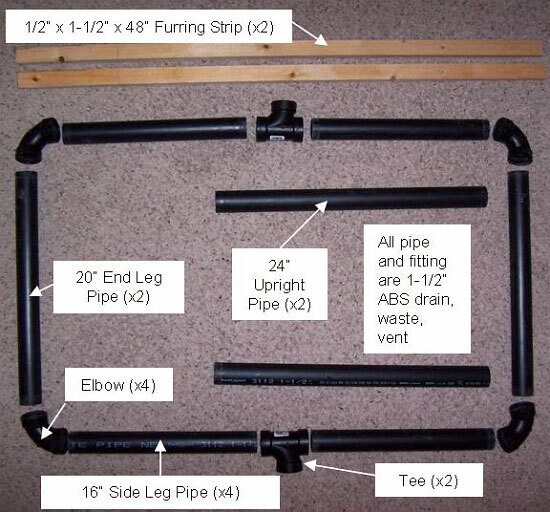 The photo below shows all the components of the base, with dimensions. The overall maximum assembled dimensions are roughly 26″ wide, 41″ deep, and 66″ tall (the cardboard is 2 x 3 ft). You can find photos of a similar home-made PVC target stand (with a slightly different rear section) on the Box of Truth website. This also employs a PVC tubing base with wood uprights. We’ve also seen all-PVC target stands, but we’ve found that it is easier to attach the cardboard to wood strips than to PVC pipe. Also, if the upper section is wood, you can fit different height targets, while using the same base. Share the post "Build a Simple, Portable PVC Target Stand"
SEB coaxial front rests are impressively engineered and beautifully machined. If you like a joystick-style rest, you won’t go wrong with a SEB. This editor shoots off one. Though the current SEB rest is nearly ideal for short-range benchrest, shooters have asked for an upgraded version that can handle heavier rifles (such as 22-lb, F-class guns), and wider fore-ends (up to 6″). Sebastian Lambang, creator of SEB rests, has been listening, and he’s hard at work perfecting a new “magnum” model that will work with big, heavy guns. 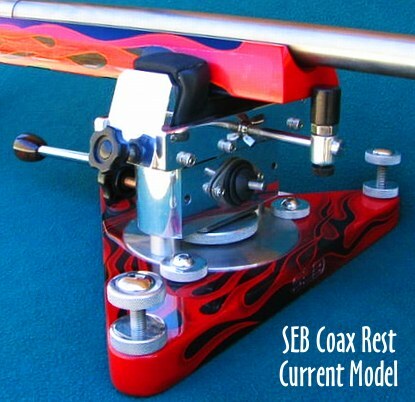 It is hoped that the new model SEB rest will be available in summer 2009, but it’s “too early to know for sure”. Seb’s goal is to make a new rest using an enhanced design (but it will still be a coaxial-type rest with double-sided functionality). It will have quicker elevation adjustment. It will also go lower and taller at the lowest & tallest setting (from about 4″ to 9″ tall, or more), and should accept rifle stocks up to 6″ wide. Here’s the good news — the price should be less expensive too. The new rest will still feature twin posts, with coarse elevation adjusted by rack & pinion. The center-to-center (“CTC”) between the posts is about 10″, to be able to accept rifle stocks up to 6″ wide. Like the current SEB rests, the new rest can be set up for either right-hand & left-hand shooters. The new rest should suit a broader set of disciplines — it will work for short range BR, F-class, long-range benchrest shooting, and varmint shooting, too. Unfortunately, because of the specifications/requirements, Seb must remove the “pivotal base system” and make the base in “T” shape. The base can be disassembled for easily for more compact storage. By design, the new model rest can accept a “Balance Weight System” (BWS) better than the standard SEB rest, because the weight (which is optional) would not interfere with the front elevation screw, the fore-end stopper, or the base. This is the reason that the new base will have be built with a “T” shape. The “BWS” is basically a counterweight, simply a chunk of stainless steel, attached on the side opposite side of the joystick. It’s an inexpensive, optional item, available in different weights. With the “BWS”, the SEB rests could accept rifles as heavy as 30 kgs (66 lbs. ), or even more. This should be able to be accomplished without holding the joystick. If the weight is correctly matched to the weight of the rifle), I suspect that the rest top & “BWS” combination would remain stationary under hard recoil. 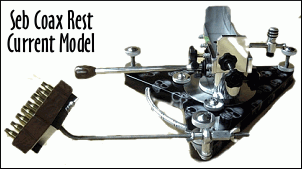 Hopefully the new rest will cost less than the current model rest. Seb is trying to keep the price under $700. This should be possible because of changes to the design and materials. It will retain the same standard of smoothness and quality that Seb is known for. Finally, Seb asks for your patience. He is still evaluating materials and is still experimenting to determine what will work best. Besides this, Seb is working on an updated front bag design as well. (There is also an improved fore-end stop in the works.) Once this new rest is ready, Seb will be shipping some to the States for testing. Personally, I can’t wait to see this new rest! Share the post "SEB Rest Update — New Model in Development"
Here’s an handy and affordable product that everyone can use in their home workshop. When working with a vise you have to be careful not to mar or gouge the item you’re clamping. People will use cardboard, old carpet, even scrap leather as “padding”. All those options can work, but magnetic soft vise jaws are a simpler solution. These come in matching sets, sold for $12-$20.00 by a variety of vendors. Measuring 4-6″ long these have an upside-down L-shaped cross-section. The are formed from a semi-soft polyurethane that won’t scratch metal (or gouge wood). Simply mount the plastic pieces over the metal jaws of your vise. The soft jaws are held in place by magnets embedded in the backside of the plastic. If you wish, you can saw off the ends of the soft jaws for a better fit on smaller vises. In todays’ report, we highlight two kinds of soft vise jaws, one with pre-formed channels and the other with flat edges. The first unit, made by Wilton, is bright yellow, with shaped channels to hold various items. Shown below, these soft jaws will hold Wood, Metal, Tubing, and more. The Wilton jaws cost $13.69 at TrueValue Hardware stores (item 606400). For those who prefer polymer vise jaws with a flat edge (no channels), Graham Tool Co. makes a nice set of Soft Vise Jaws, priced at $19.95. 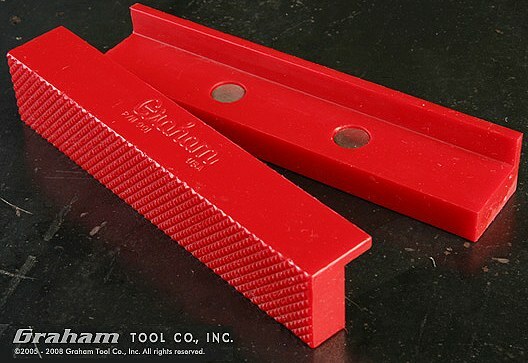 Graham’s bright red vise jaws feature a flat contact surface with shallow, diamond-pattern serrations. The Graham soft jaws feature powerful rare-earth magnets, so they secure to your metal vise more securely than most other types of plastic jaws. Soft vise jaws can hold a barrel for fine work, such as engraving. However, they are not designed to resist large torque loads. Soft jaws are NOT suitable for barrel removal and installation. 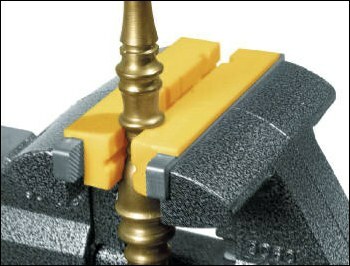 For those tasks, use a dedicated barrel vise with the appropriate clamping insert. Share the post "Magnetic Soft Vise Jaws"